Today I am going to talk about one of the biggest and the powerful routing machine engine of Cisco routing portfolio which is used in the service provider environment. This Powerful machine is the strength of the Cisco and deployed in the biggest environment where the throughput requirement is much higher than the enterprise networks. Yes, I am talking about the Cisco ASR 9000 series routers .The Cisco ASR 9000 Series deliver exceptional high availability into Carrier Ethernet transport networks for applications including residential broadband services, efficient IPTV and video distribution, voice over IP (VoIP), business VPN services, and mobile applications such as backhaul transport. To support these applications, the Cisco ASR 9000 Series is designed to work with many different types of access technologies, to reach all customers (for example, DSL, passive optical networks [PONs], Ethernet, cable, and mobile). The router is powered by Cisco IOS XR Software-an innovative self-healing, distributed operating system designed for continuous system operations and supporting network resiliency to maximize overall network availability for these applications. The Cisco ASR 9000 Series Aggregation Services Router system provides unsurpassed 10GE and 100GE scale and density. The Cisco ASR 9006 and 9010 routers provide an in-place upgrade roadmap to higher density of 10GE and 100GE ports without the need for a complete chassis replacement. The modular power architecture of Cisco ASR 9000 Series (available in both AC and DC versions) includes three power supplies: 3-kW AC, 2-kW DC, and 1.5-kW DC. For the Cisco ASR 9922, only 2-kW DC and 3-kW AC power supplies are applicable. The power supplies are housed in field-serviceable Power Entry Modules (PEMs), which come in AC and DC forms. Each PEM can hold up to 3 modules (Cisco 9006 and 9010 ) or 4 modules (Cisco 9922) of its corresponding type with no power zones or placement restrictions (mixing of AC and DC supplies is not supported). Service providers can add more power as their bandwidth and feature requirements increase over time, by adding more line cards to the chassis. This capability translates to lower CapEx initially and optimal OpEx over the product life. The Cisco ASR 9000 provides a carrier-class solution to Carrier Ethernet service delivery by taking advantage of Cisco experience in core routing and extending that design to the network edge. Newer routing design should support distributed architectures with distributed asynchronous forwarding engines and distributed asynchronous route-processing capabilities to remove single points of failure. Route switch processors (RSPs): RSPs are deployed in "active" or "standby" configurations. The Cisco ASR 9000 Route Switch Processor is designed with load-shared redundancy to support software upgrades and software patches. Switch fabric: Using an active/active configuration model allows for distribution of the traffic load across both switch fabrics, taking advantage of the processing capacity of both switch fabrics. If a failure occurs, the single active switch fabric continues to forward traffic in the system, with hardware support for zero packet loss on fabric online insertion and removal (OIR). Because both switch fabrics are active and forwarding traffic, they are both ready to assume the full traffic load. Power supplies: Redundant power supplies are deployed in load-balanced configurations to share the load across all power supplies. You can also configure the power supplies in 1:1 and 1:N modes to provide power-supply redundancy. An example of this configuration is 3:1 redundancy, where one redundant power supply is used to back up the other three power supplies. Fan trays: Redundancy is offered on a single fan tray (that is, through multiple fans) and between fan trays. If a fan tray fails, fan-tray redundancy allows for the protection of the fan tray, giving service providers an alarm and time window over which they can replace the failed fan tray. Line cards: The Cisco ASR 9000 Series can handle faults by bundling and protecting ports together on multiple line cards by supporting IEEE 802.3ad Link Aggregation. 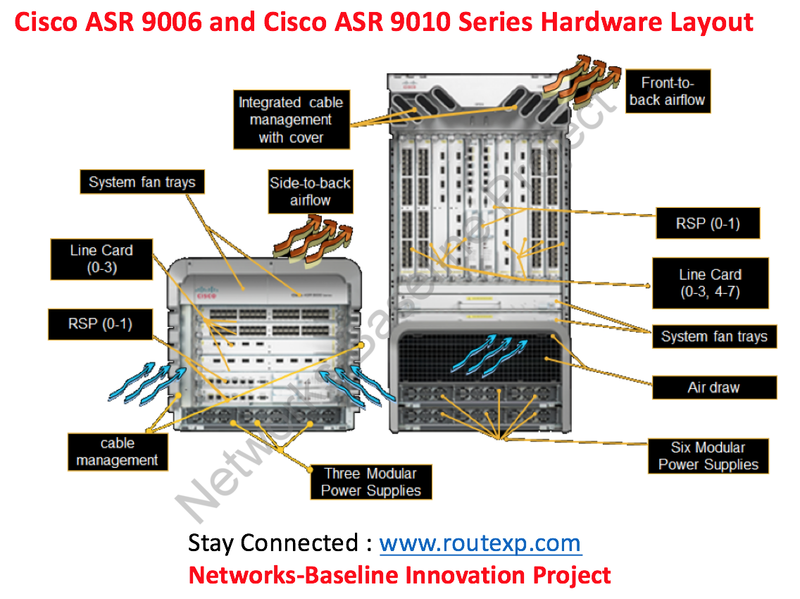 Cisco ASR 9000 line card redundancy is supported through the bundling of up to eight interfaces across line cards into a single, logical Layer 2 or Layer 3 connection. Fast failover between ports within a bundle occurs if any port fails, providing more flexibility than simple linecard redundancy. This allows service providers to support stringent customer SLAs. Operating system: System infrastructure components are distributed to all cards in the system, and relevant data is replicated on different cards based on usage. This setup avoids single points of failure and allows distribution of applications based on resource availability. Global IP traffic is forecast to reach nearly a zettabyte by 2015 and will traverse more than 15 billion devices, compelling network operators to seize growth opportunities while monetizing new services. Operators must also optimize operations, reduce expenses, and improve scalability and flexibility - all to deliver Next-Generation Internet experiences across all devices and locations. The Cisco ASR 9000 Series is a true carrier-class solution. It features the modular, microkernel-based Cisco IOS XR Software operating system, comprehensive system redundancy, and a full complement of network resiliency schemes. It also offers a unique service- and application-level intelligence that focuses on optimized video delivery and mobile Internet. The Cisco ASR 9000 Series also features a fully integrated timing infrastructure, allowing the routers to take in timing inputs (for example, Synchronous Ethernet, Building Integrated Timing Supply [BITS], and Data Over Cable Service Interface Specification [DOCSIS] Timing Interface [DTI]) and distribute them over the backplane to each slot. This capability allows extensive support for transparent mobile convergence, mobile Radio Access Network (RAN) backhaul, and Time-Division Multiplexing (TDM) circuit emulation, without sacrificing performance or scale.